Trade agreements can inadvertently facilitate drug trafficking due to exploitation of the free movement of goods, vehicles, and passengers. Turkish police report that the overall volume of drug seizures from Iranians has increased significantly subsequent to the 2007 Iran-Turkey memorandum of understanding. The dilemma of balancing free trade and national security has captured the attention of many scholars in the post-9/11 era. According to these analysts, the threat posed by terrorists and organized crime syndicates could undercut, and potentially outweigh, the possible positive outcomes of economic-integration processes. In particular, drug-trafficking syndicates may exploit the opportunities presented by free trade as the increasing numbers of international containers and travelers make it extremely difficult to devote appropriate time to security checks at the borders. Beyond the risks associated with the international flow of goods, several analysts have argued that the free movement of capital also functions as a catalyst for laundering the proceeds of illicit drug trade. On the other hand, there are those who claim that the benefits of the free-trade regime outweigh associated security costs. Laissez-faire economists oppose strict security controls on foreign trade because they perceive free trade as an essential requirement for economic development. Some have argued that no strong evidence exists on the catalyzing impact of trade openness on trans-border drug trade. Others maintain that enhancing trade relations may pave the way for greater cooperation among the security agencies. Economist Patrick Clawson and political analyst Rensselaer W. Lee suggested that enhanced cooperation may strengthen institutional capacities of the drug enforcement agencies and overcome the negative impacts of trade openness. While governments often seek trade expansion and economic integration with surrounding states for the common good, trade agreements can inadvertently facilitate drug trafficking due to exploitation of the free movement of goods, vehicles, and passengers. This was clearly the case with Turkey. Over the years, it has been involved in various economic integration projects, including the Economic Cooperation Organization (1985), the Black Sea Economic Cooperation initiative (1992), and the European Union Customs Union (1995). The AKP government, which came to power in 2002, has been an avid proponent of regional economic integration and elimination of trade barriers and has signed free-trade agreements and adopted a free visa regime with potential regional trade partners. In this context, Ankara and Tehran signed two comprehensive energy and trade agreements in 2007 and 2008, and top executives in both states promised to increase the volume of bilateral trade to $20 billion within the immediate future. These efforts to promote regional economic integration have had a significant impact on Turkish-Iranian trade. From 2005 through 2010 (the period studied in this article), annual bilateral trade increased 144 percent from $4.4 billion to $10.7 billon (see Figure 1). Turkish exports in the same period increased from $913 million to $3 billion, with imports growing from $3.47 billion to $7.45 billion. The aggregate trade in the post-entente period (2008-10) was significantly higher than its precursor. The total trade at that time was $19.1 billion which increased 27 percent to $26.4 billion. Over 95 percent of Turkey's imports from Iran were in the form of energy, mainly petroleum and natural gas, while exports were mainly in the form of electronics and other finished goods. Increasing economic integration can also be gauged by the number of passengers and vehicles coming out of Iran. The number of Iranian passengers entering Turkey increased 96 percent (from 957,245 to 1,885,097) from 2004 to 2010 while the number of vehicles entering Turkish territory from Iran increased 102 percent. In aggregate, the number of passengers was 53 percent higher and the number of vehicles 50 percent higher in the post-entente period. One of the more interesting findings was that close to a million Iranians did not return home after their arrival in Turkey. Many stayed on, living as illegal aliens and often engaging in drug related crimes. The Turkish Department of Anti-Smuggling and Organized Crime (Kaçakçılık ve Organize Suçlarla Mücadele Dairesi Başkanlığı, KOM) reported in 2011 that Iranians constituted the largest group (34 percent) of foreign nationals involved in drug trafficking in Turkey that year. In the previous decade, Iranians were also the dominant foreign group in drug trafficking. 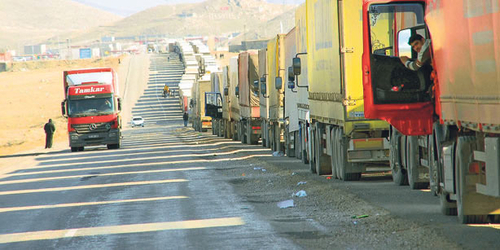 KOM investigations revealed that the trucks transporting legal goods to Iran were often exploited to bring drugs into Turkey and that the number of vehicles confiscated from drug trafficking increased 31 fold between 2005 and 2010. The bulk of these vehicles carrying heroin, methamphetamine, and cannabis came from Iran. The number of vehicles in the post-entente period confiscated by the KOM for drug trafficking charges was almost six times higher than the earlier triennial period studied. It should also be noted that although KOM seizures do not represent the entire Turkish national figures, they do represent the vast majority of drug related information in Turkey. Nonetheless, the general trend lines indicate that economic integration spurred the number of border crossings by land vehicles, and a significant portion of these vehicles were used for drug trafficking. In 2009, Turkey's imports and total trade volume declined sharply due largely to energy supply disruptions (see Figure 1), yet Turkish law enforcement agencies seized a record level (16 tons) of heroin coming out of Iran. The authors studied six years: 2005-2007 (before entente) and 2008-2010 (after). During these years, 361 operations were classified as Iran-related, international drug-trafficking cases with at least one Iranian suspect arrested in each incident. In these operations, 1,294 people were involved in drug trafficking; of the traffickers, 578 were Iranians, 671 Turks, and 45 of other nationalities. 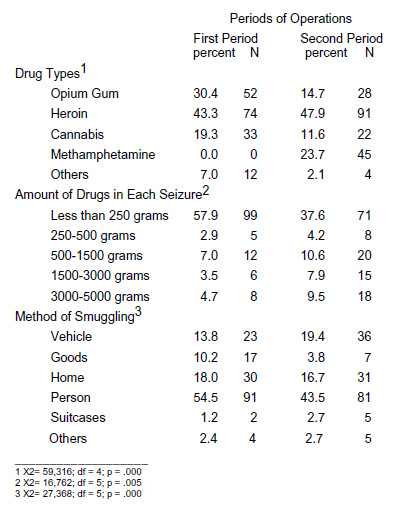 Heroin constituted the highest proportion of drug seizures (45.7 percent) while the second most frequently seized drug was opium, followed by cannabis and methamphetamine. (See Table 1.) Transnational crime syndicates used various concealment and transshipment methods. Seizures on the courier's body were most common, followed by seizures from residences and vehicles. Among the 361 interdictions, 23.5 percent were linked to organized crime groups while 76.5 percent were classified as individual-level drug trafficking attempts. All in all, law-enforcement units seized 746 kilograms (kg) of heroin, 555 kg of cannabis, 305 kg of opium, and 21 kg of morphine base in 2005-07, but the number of heroin seizures doubled during the second term to 1,539 kg. While there was also a sharp decrease in cannabis and opium seizures, methamphetamine began to appear mainly after 2008 and increased sharply thereafter. The international trafficking trend moved from inexpensive drugs such as cannabis toward more expensive drugs such as methamphetamine and heroin. The number of counter-narcotics operations by Turkish law enforcement agencies targeting Iranian syndicates increased regularly over the six year period with the total number of operations rising 11 percent from the pre-entente period. Of the 495 suspects arrested in the first period studied, 239 were Iranian, 241 Turks, and 15 were from other nations. Of the 799 suspects in the second period, 339 were Iranians, 430 were Turks, and 30 were other nationalities. While the number of operations did not change dramatically in the two periods, a significantly higher number of people were involved in drug trafficking in 2008-2010. The case file analysis indicated that transnational drug networks planned more sophisticated trafficking schemes in the post-entente period, thus necessitating a greater numbers of actors. The volume of the trafficked drugs and the transportation methods used display the growing capabilities of drug-trafficking networks. In general, higher volume is a sign of a network's greater capacity. The amount of drugs found in each seizure also changed between the two periods: Seizures below 250 grams fell while seizures above 5,000 grams rose. In 2008-2010, traffickers tended to carry drugs in higher volumes, which in turn, required more space and carrying capacity. The amount of drugs carried is closely related to the methods of transportation available between production sites and consumption markets. In general, route longevity and border-control rigidity have an impact on drug shipment quantities. While drugs on couriers' bodies constituted the primary method of trafficking between Iran and Turkey in both periods, case file analysis shows this method decreased in the later post-entente period. As expected, due to eased restrictions, the use of motor vehicles for trafficking rose. There was a marked decrease in drug trafficking through concealment in goods (the personal belongings of passengers), which may, in turn, reflect the ease by which drugs could now flow in through vehicles and freight. When border controls are tight, traffickers are more likely to recruit drug couriers who can carry no more than 5 or 6 kilos regardless of the carrying methods (e.g., wrapping, swallowing, and inside luggage). For larger scale trafficking activities, the crime syndicates need to calculate the risks at customs, provide appropriate documentation, and use vehicles that require more space for smooth transition at the borders. The content analysis of the case files indicated that the economic integration and higher trade volumes provided ample opportunities to conceal drugs within the legal freight between Iran and Turkey. The research further shows that the percentage of suspects linked to a criminal group in 2005-07 increased in the second study period (see Table 2). These findings can be explained two ways and are not mutually exclusive. First, law enforcement increased its operational capacity and was able to identify more criminal groups through investigations. Nevertheless, criminal groups expanded their capacity and used more sophisticated connections for drug trafficking. The success of law enforcement is partially determined by its information gathering. The use of intelligence-based analyses increased from 3 percent to 24.9 percent in the second triennial period allowing law-enforcement personnel to identify more connections between Iranian and Turkish criminal groups. Turkish law enforcement agencies have long used domestic intelligence to combat drug traffickers. The upsurge in drug trafficking, however, would call for greater cooperation with Iranian drug-enforcement agencies. The success of routine law-enforcement controls and officers' risk analysis played greater roles during the second term. 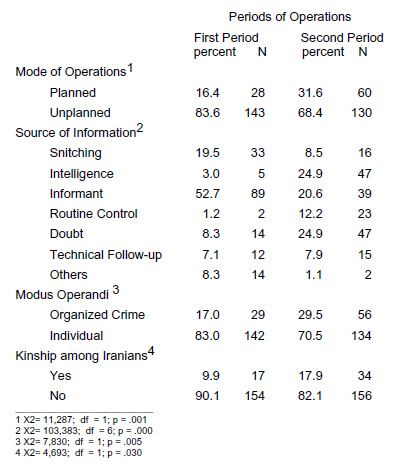 On the flipside, the use of informants decreased in the second term (Table 2). Routine controls at borders are managed by regular police or customs officers, who have no advanced training in drug interdictions. A significant increase in drug seizures at the borders is an indicator of increasing volume of drug trafficking between Iran and Turkey. The total number of actors involved in trafficking, regardless of nationality, also rose. The study indicates that the nature of drug trafficking has changed: More people became involved and had more complex relationships, connecting different ethnic groups into a single criminal task. Ankara's burgeoning trade relations with Tehran over the past decade have significantly worsened its drug problem. 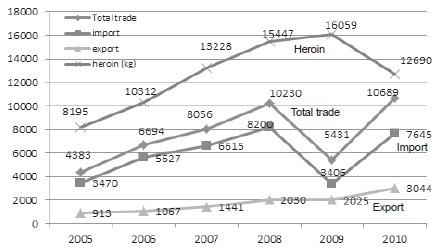 While Iranians were long considered the principal ethnic group in Turkey engaged in drug-related crimes, their activity has significantly widened as a result of the 2007 memorandum of understanding with Iranian transnational syndicates stepping more aggressively into the fray and the overall volume of drug seizures from Iranians rising sharply. In addition to the existing opiate and cannabis trades, drug traffickers began to exploit new substances such as methamphetamine. This broadening repertoire indicates that Iran has become a significant source or transit destination for drugs. Turkish law-enforcement agencies seized substantially larger amounts of drugs even from the non-Iranian crime syndicates, but with 80 percent of the methamphetamine seizures involving Iranian individuals, it is hard not to conclude that Iranian nationals are overseeing the bulk of methamphetamine trafficking across Turkey. This state of affairs notwithstanding, Turkish-Iranian security cooperation remains surprisingly limited, with drug enforcement agencies rarely sharing actionable intelligence and no joint operations carried out. The KOM has conducted 166 international controlled interceptions, but none were performed with Iranian counterparts. Turkish and Iranian agencies should enhance information exchange and execute joint operations to compensate for the negative impacts of the open-border policy. Over the past three years, illicit drug trade from Iran to Turkey has diversified with significant quantities of methamphetamine and cannabis trafficked apart from heroin. As a result, Tehran has become the main source of methamphetamine targeting the Asia-Pacific region: According to KOM statistics, a total of 2.2 tons of heroin, 570 kg methamphetamine, and over 10 tons of cannabis were seized from Iranian nationals between 2010 and 2012. The traffickers exploit Turkish licit trade arrangements with both Iranian and Asia-Pacific markets as the free-visa regime allows recruitment of abundant couriers by the transnational crime syndicates. This, in turn, necessitates that Ankara and Tehran enhance the capacity of the Drugs and Organized Crime Coordination Unit of the Economic Cooperation Organization to overcome the unintended consequences of regional economic integration. This issue has broader policy implications for the international community. While governments have a legitimate imperative to seek ways of enhancing the economic well-being of their citizens, they would do well to remember that economic integration can have adverse security implications as free trade may facilitate the operations of transnational criminal organizations and expand black markets. Additionally, trans-border criminal enterprises and underground financial transactions could blunt the impact of sanctions placed on Iran. A major limitation in data gathering for this article has been the dearth of statements from convicts about the influence of free-trade agreements on their motivation and on drug trafficking in general. In the existing interviewing system, criminals are often asked about their own roles, their cooperators, vehicles, and the whereabouts of the activities and modes of operation, but only a limited number of interviewees claimed that free-trade agreements had been a major catalyst for their drug-trafficking activities. A further difficulty is the lack of information about the volume of non-interdicted narcotics. Law enforcement agencies cannot come up with a ratio of interdicted to non-interdicted drugs while transnational crime syndicates may use alternative routes when confronted with intensified counter-narcotics measures. Global structural shifts in heroin markets can also have defining effect on seizures. The rise of the Russian market and the downsizing of consumption in Europe may shift the heroin routes and reduce the abuse of licit trade by traffickers along the traditional Balkan route. Behsat Ekici is a superintendent at Turkey's Central Narcotics Division of the Department of Anti-Smuggling and Organized Crime and teaches at the Institute of Security Studies in Ankara. Ali Unlu is a superintendent at the Narcotics Division of the Istanbul Police Department and head of its Drug Prevention and Monitoring Unit. Turkish Institute of Statistics, Turkish Ministry of Customs, Ankara, 2013, accessed Jan. 21, 2013; "Araç Istatistikleri," Turkish Ministry of Customs, Ankara, 2013, accessed Jan. 21, 2013. The economic integration process has been institutionalized by the Economic Cooperation Organization based in Tehran. Other disagreements, such as the deployment of NATO antimissile systems on Turkish soil, had limited effect on the bilateral relationship as Ankara has emerged as a major economic provider for Iran since 2011 when the international sanctions began to bite seriously. See Nadar Habibi, "Turkey and Iran: Growing Economic Relations Despite Western Sanctions," Middle East Brief, Brandeis University, Crown Center for Middle East Studies, May 2012. Behsat Ekici, Is Turkey Realigning? A Three Dimensional Investigation of Turkish Iranian Security Rapprochement (Saarbrücken: Lam and Lambert Publishing, 2012), p. 61. Peter Andreas and Ethan Nadelmann, Policing the Globe: Criminalization and Crime Control in International Relations (New York: Oxford University Press, 2006), p. 37; Ekici, Is Turkey Realigning? p. 292; Annual Drug Report 2012 (Ankara: Department of Anti-Smuggling and Organized Crime Publications [hereafter, KOM], Turkish Monitoring Centre for Drugs and Drug Addiction [hereafter, TUBIM], 2012), pp. 58, 147; Phil Williams, "Cooperation among Criminal Organizations," in Mats Berdal and Monica Serrano, eds., Transnational Organized Crime and International Security: Business as Usual (Boulder: Lyenne Rienner, 2002), p. 75. See, for example, Raymond W. Baker, Capitalism's Achilles Heel: Dirty Money and How to Renew the Free-Market System (Hoboken, N.J.: John Wiley and Sons, 2005), p. 183; Berdal and Serrano, Transnational Organized Crime and International Security, p. 49; Phil Williams, Criminals, Militias, and Insurgents: Organized Crime in Iraq (Carlisle, Pa.: U.S. Army War College Press, Strategic Studies Institute, 2009), p. 221; Thomas R. Naylor, Wages of Crime: Black Markets, Illegal Finance, and the Underworld Economy (Ithaca: Cornell University Press, 2002), p. 44. "Container Control Programme," U.N. Office on Drugs and Crime, New York, and World Customs Organization, Brussels, June 2009. Baker, Capitalism's Achilles Heel, p. 48; William F. Wechsler, "Follow the Money," Foreign Affairs, July/Aug. 2001, pp. 40-57. Joseph E. Stiglitz and Andrew Charlton, Fair Trade for All: How Trade Can Promote Development (New York: Oxford University Press, 2005), chap. 13; Jacques Delors, "European Integration and Security," Survival, Mar./Apr. 1991, pp. 99-109. Horace A. Bartilow and Kibong Eom, "Free Traders and Drug Smugglers: The Effect of Trade Openness on States' Ability to Combat Drug Trafficking," Latin American Politics and Society, 2 (2009), p. 122. Patrick Clawson and Rensselaer W. Lee, The Andean Cocaine Industry (New York: St. Martin's Press, 1996), p. 250. Nihal Yıldırım Mızrak, Dünya Ekonomisinde Bütünleşme Hareketleri ve Türkiye (Ankara: Siyasal Kitabevi, 2005), chap. 1. Ekici, Is Turkey Realigning? p. 218. Ministry of Customs and Turkish Institute for Statistics Turkish Institute of Statistics, Turkish Ministry of Customs, Ankara, 2013, accessed Jan. 21, 2013. Behsat Ekici and Salim Ozbay, "Iranian Methamphetamine and Turkey: An Emerging Transnational Threat," Trends in Organized Crime, 10.1007/s12117-013-9204-6, 2013, p. 2. KOM, MNS (Mali, Narkotik, Silah) database, accessed July 15, 2013. Annual Drug Report 2011 (Ankara: KOM, TUBIM, 2011), p. 152; Kaçakçılık ve Organize Suçlarla Mücadele: 2010 Raporu (Ankara: KOM Yayınlar Dairesi Başkanlığı, 2010), p. 10. Ali Unlu and Ugur Evcin, "Sosyo-Ekonomik Ve Çevresel Faktörlerin Sokak Satıcıları Üzerindeki Etkileri: Istanbul'da Kesitsel Bir Çalışma," Polis Bilimleri Dergisi, 2 (2011), pp. 29-48; Ali Unlu and Behsat Ekici, "The Extent to which Demographic Characteristics Determine International Drug Couriers' Profiles: A Cross-Sectional Study in Istanbul," Trends in Organized Crime, Dec. 2012, pp. 296-312. The Global Afghan Opium Trade: A Threat Assessment (Vienna: U.N. Office on Drugs and Crime, 2011). Related Topics: Criminality, Iran, Turkey and Turks | Fall 2013 MEQ receive the latest by email: subscribe to the free mef mailing list This text may be reposted or forwarded so long as it is presented as an integral whole with complete and accurate information provided about its author, date, place of publication, and original URL.